Lighthouse Marine Boat Sales > Water Sports > The Best Towable Toys! The beach resort staple is a sure-fire hit for kids – fit up to five on board for guaranteed fun. You’ll have the time of your life on this “water weenie” designed for 1 to 3 riders. HOT DOG has deluxe nylon-wrapped handles with neoprene knuckle guards. There are three neoprene seat pads for comfort and to help you stay on top. It’s a whopping 103″ long x 44″ wide. Rope hook-ups are super easy with the heavy-duty Kwik-Connect. Three 30-gauge vinyl air chambers are fully encased by a double stitched 840-denier nylon cover. It’s equipped with an Boston valve for the ultimate in inflating and deflating convenience. For one to three riders, the Mable can be towed from either end and serves as either a comfy chair or wild chariot ride. The new and improved classic SUPER MABLE towable will continue to impress you with a variety of different riding options. Featuring dual tow points, you can go for a wild ride utilizing the comfy backrest or tow them the opposite direction for a chariot style blast you’ll never forget. All three sizes come equipped with comfy EVA foam seating pads. A multitude of double webbing foam handles with knuckle guards enable lots of different riding positions. The addition of air cushioned side walls will keep you on board while the redesigned backrest and new custom graphics make this uniquely shaped towable dressed to impress. The patented Speed Safety Valve and aluminum Quick Connect tow point will save you time. The SUPER MABLE features a heavy-duty K80 PVC bladder and double stitched full nylon cover with self bailing drain vents. They also make the perfect deluxe lounge at any pool, beach, lake, or river. 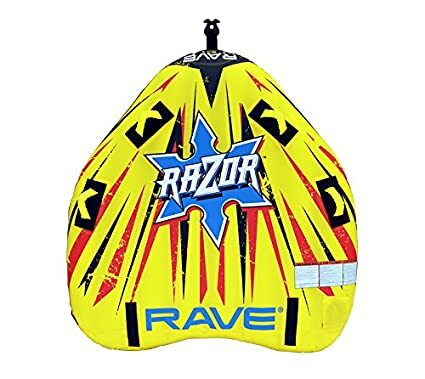 The Rave Razor Prism Tube is easily towed by all types of watercraft and features a rear boarding strap for easy boarding. The sharp lightweight Razor is a great deck tube that enables the rider to show off the bottom graphics during stunts, and with a low profile for maneuverability and a skim-fast bottom that responds to waves quickly, you’re sure to have the ride of your life! AIRHEAD BLAST – You’ll have a real blast on Airhead Blast. The 4 neoprene knuckle guards and deluxe nylon covered handles provide a sure and comfortable grip. The heavy-duty virgin PVC bladder has electronically welded seams and a Boston valve for quick inflating and deflating. Blast has a double stitched nylon cover, reinforced internal tow harness and a self-draining floor vent. 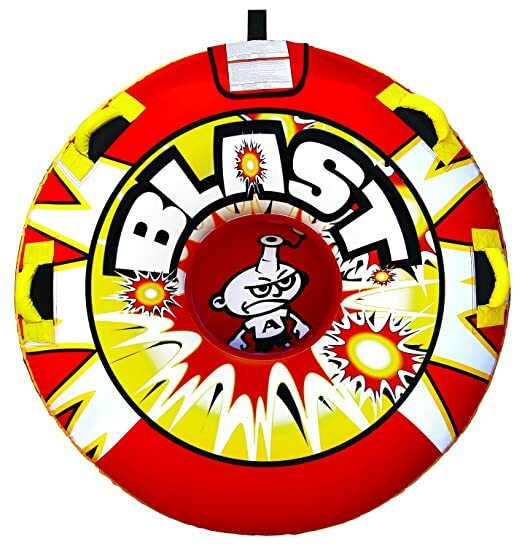 You’ll love the eye-catching graphics on this 1 rider 54˝ (deflated) round towable. Deep, secure seats, headrests and handles make this a safe way to get smaller children and nervous adults out on the water. MACH 2 also has a wild side, making teens and adults happy too. The inflated floors provide a comfortable seat. Four deluxe handles with neoprene knuckle guards provide a secure and comfortable grip. The heavy gauge PVC bladder and durable double-stitched nylon cover ensure years of service. Equipped with a patented Speed Safety Valve for easy inflating and deflating.